Kansas City is Amazing. It offers so much to Travelers and Locals alike. History buffs will find the area full of interesting locations, features and stories. The Kansas City area is rich in the history of America’s movement westward. 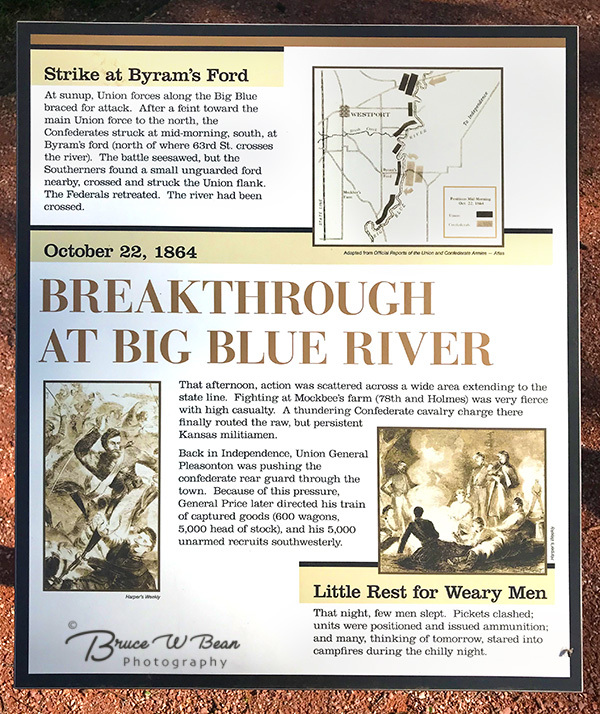 Located at the confluence of the Kansas And Missouri Rivers, the area quickly developed as an important staging area for pioneers heading west on the Oregon , California and Santa Fe Trails. Most staging and provisioning took place at the time in the town known as Westport. Nearby Kansas City later grew, expanded and ultimately annexed the town of Westport into the city of Kansas City. In the 1860’s Westport was still an independent town in it’s own right. Eventually the Westport and Kansas City area were drawn into the U.S. Civil War along with the State of Missouri which officially had Union status. 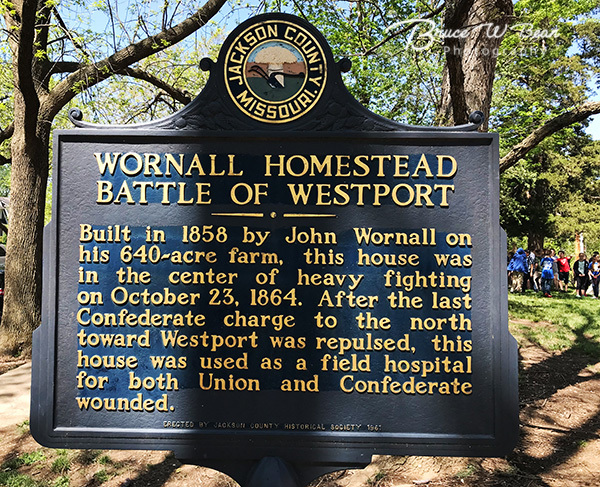 The area’s most prominent war action – The Battle of Westport – occurred as the Civil War was winding down. On September 19th, 1864 Major General Sterling Price led his Confederat Expeditionary Force northward into Missouri out of Arkansas in hopes of taking St.Louis and turning the State of Missouri for the South. 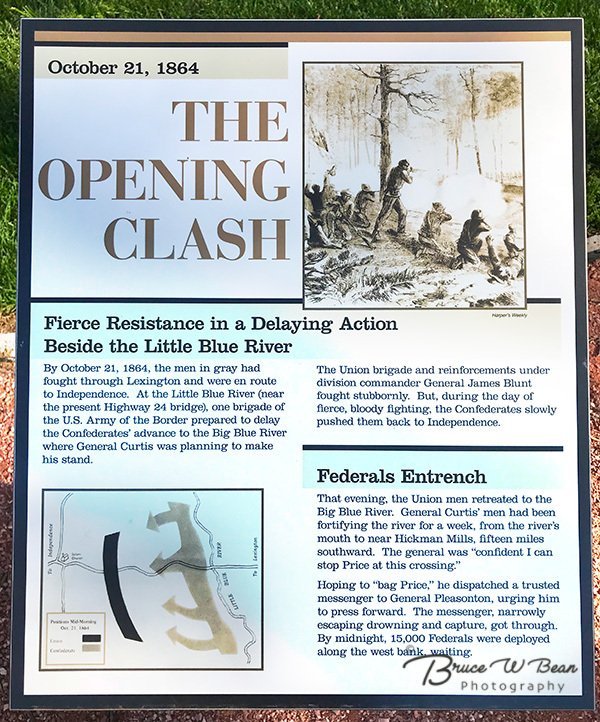 General Pleasanton’s hastily assembled Union forces were successful in blocking Price’s advance on St. Louis at the Battle of Ft. Davidson on September 27, 1864. 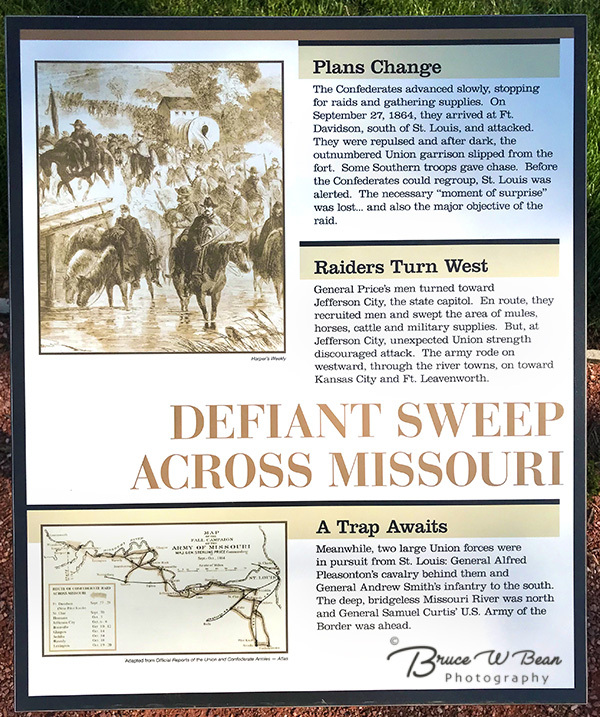 Unable to reach his primary objective, Price’s Confederate troops turned westward with a plan to take Ft. Leavenworth which lies to the north of Kansas City. A rather complex series of brief encounters and scuffles followed with the Confederates arriving in the Kansas City area after having been repulsed by various Union forces along the way which prevented Price from even challenging a possible secondary objective of taking the Missouri capital of Jefferson City. 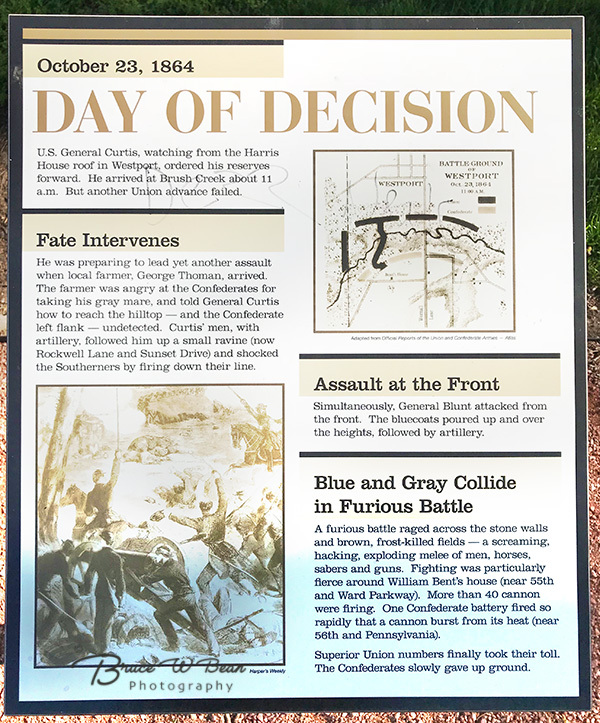 Officially, The Battle of Westport was fought on October 23rd, 1864 but there were notable preliminary actions on October 21st and October 22nd. 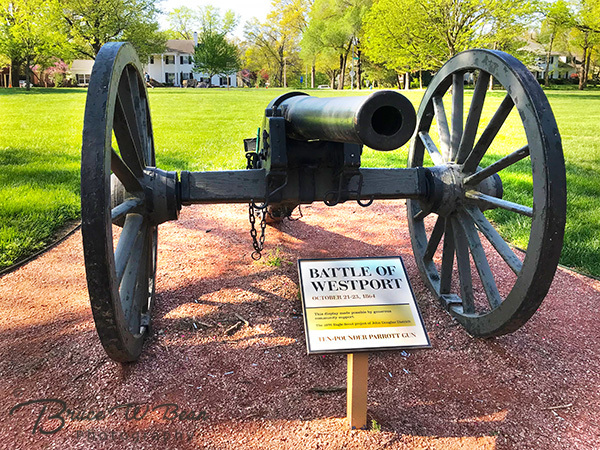 Westport was one of the largest battles fought west of the Mississippi. Over 30,000 troops were engaged over the course of the fighting. 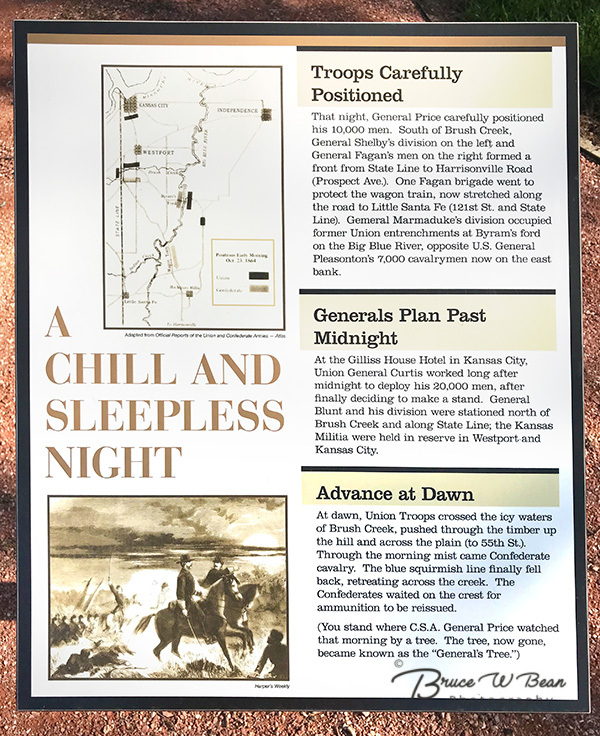 The battle and fighting ranged from north to south in the Kansas City area, moving from Westport southward through Brush Creek and what is now Loose Park, then further south. 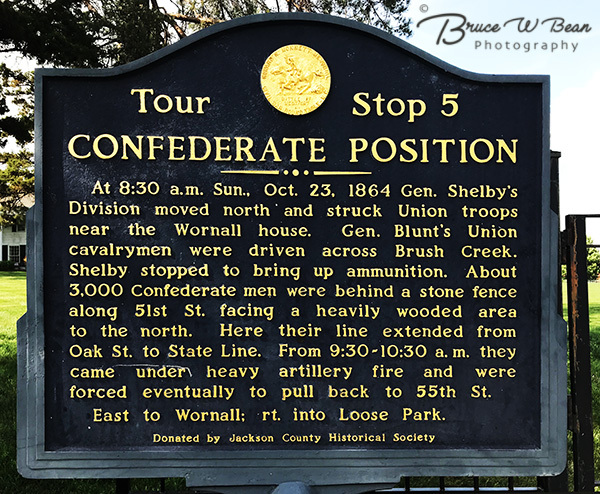 The course of the Confederate Campaign into Missouri, which ended with the Battle of Westport, is described in a series of markers, shown below, which are located at the southern end of Loose Park, at Stop 8 on the Auto Tour described below. The markers give a perspective on the battle, helping to put all the action and troop movements into context. 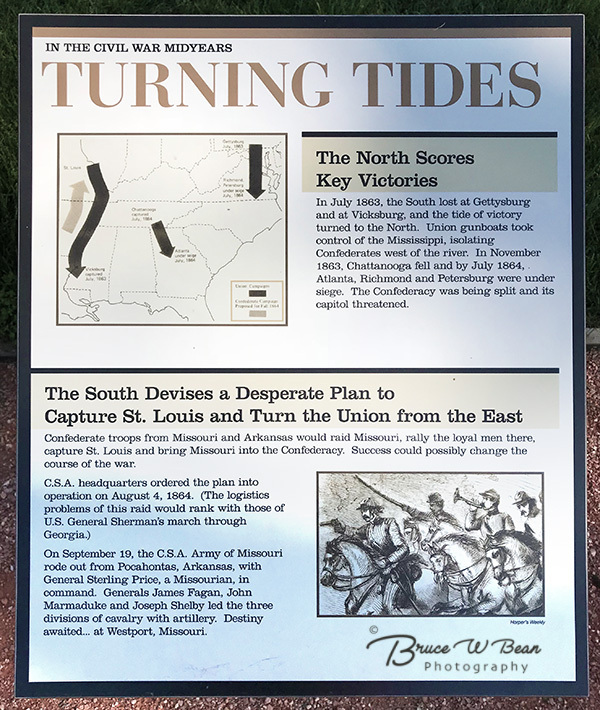 The final result of the Confederate incursion into Missouri and the major Battle of Westport was considered a Union victory. 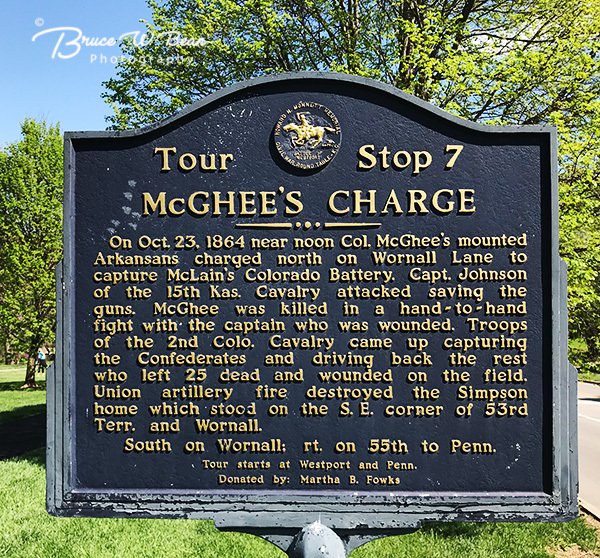 Price’s remaining troops, under pursuit and harassment from Union forces, retreated southward along what is today the Kansas / Missouri border, Eventually, the surviving Confederate troops returned to Arkansas. 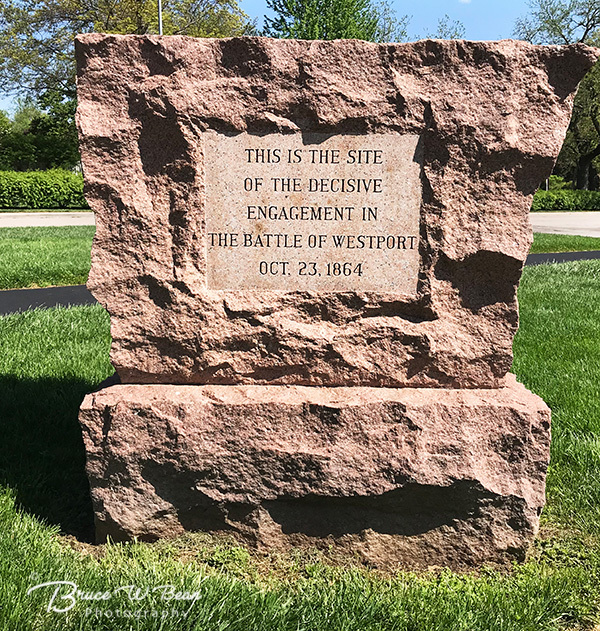 Civil War history buffs can follow The Battle of Westport’s progress across today’s Kansas City landscape.The Monnett Battle of Westport Fund helped establish a “Self Guided Audio Tour” of locations associated with the battle. You can get more information about the tour and Download Tour Details And Maps from www.battleofwestport.org. You can also download GPS locations for the tour as well as a file that will allow you to view all Tour stops on Google Earth at www.thecivilwarmuse.com . The tour includes a total of 23 locations, each with a marker giving a brief description of events at the site. Moving from the first point in Westport to the final point at 96th Terrace and Warnall Road covers a total of 32 miles. I attempted to follow the complete tour route recently and quite honestly found it to be a bit of a challenge. Be aware, the markers are not always obvious or apparent. Sometimes you really have to explore and scour the area described by the tour map in order to discover the markers. I was eventually able to find most markers, but some managed to elude me – and I live in the area! Overall I spent around five to six hours exploring the route. Not surprisingly, the areas where the battle occurred have changed greatly since 1864. What were relatively open and rural areas in 1864 have grown into fully developed modern neighborhoods today within the Kansas City area. Following the auto route to each marker will give a visitor a very general sense of the area and distances covered in the battle. However most locations today give little visual opportunity to view and experience the landscape or structures as they were at the time of the battle. The Tour begins in the Westport area of Kansas City. The sign above marks the beginning of the tour route with others of similar design marking other stops along the way. Westport itself is actually an area with an interesting and varied history and well worth a visit in it’s own right. For example it was the intersection for the California, Santa Fe and Oregon Trails. 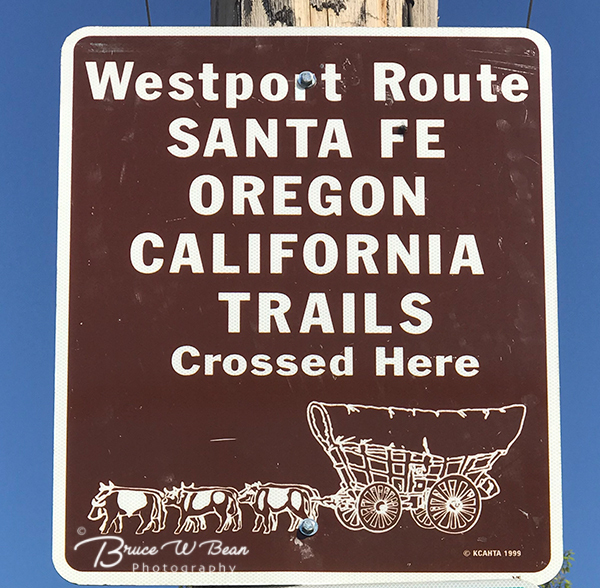 Westport also has connections to Daniel Boone. 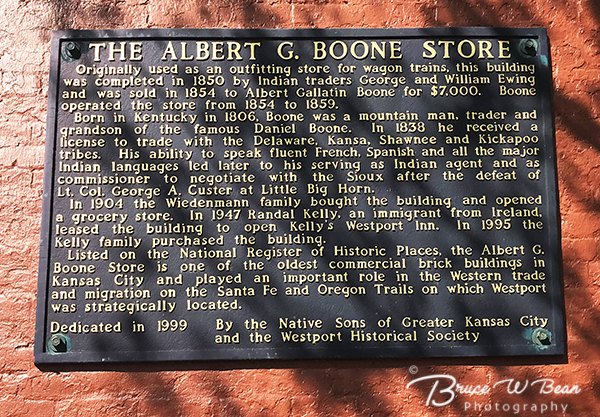 Albert Boone, Daniel’s grandson, owned and operated a general store here between 1854 to 1859. 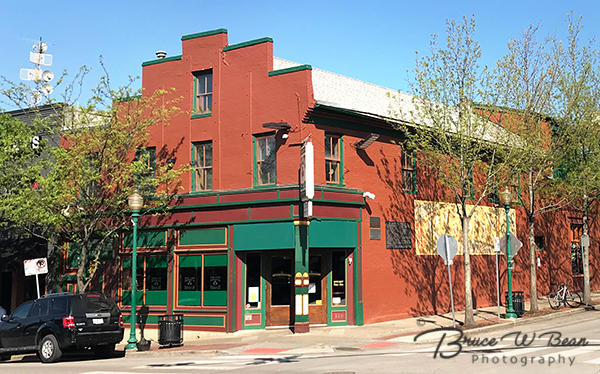 In 1947 Randal Kelly opens Kelly’s Westport Inn in the same building. 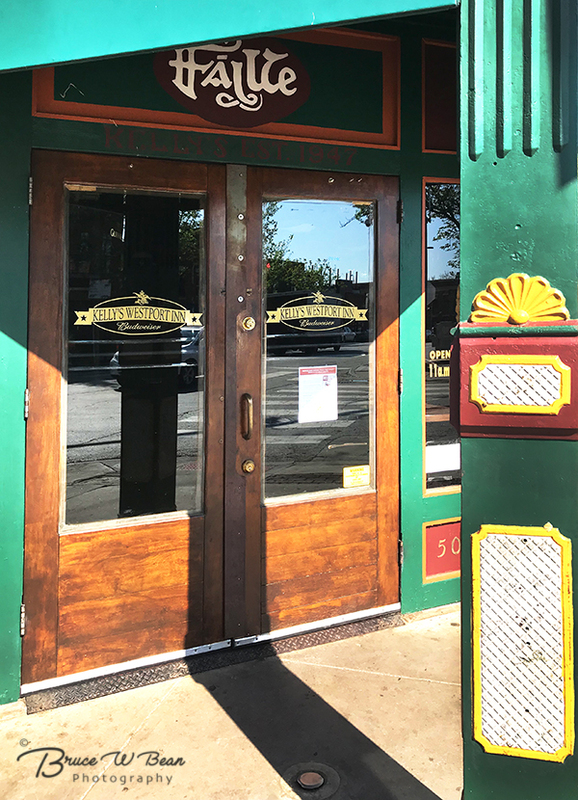 Today, Kelly’s of Westport, known in the community simply as “Kelly’s” continues to be a landmark drinking establishment on the central corner of Westport. 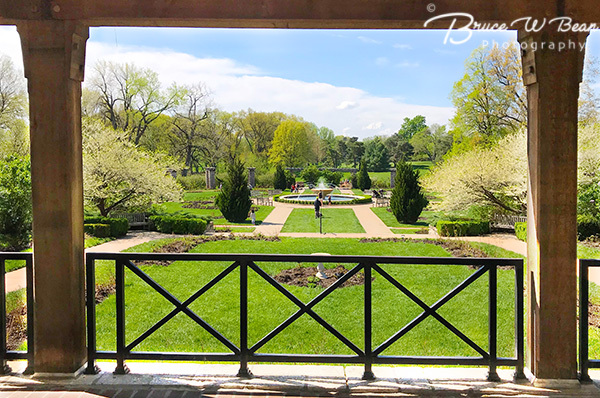 Today the Westport area of Kansas City is a trendy entertainment area with lots of great restaurants and drinking establishments. If you start your tour here in the morning hours you will have the place to yourself. But if you return to Westport after your tour you will find it is bustling with action. 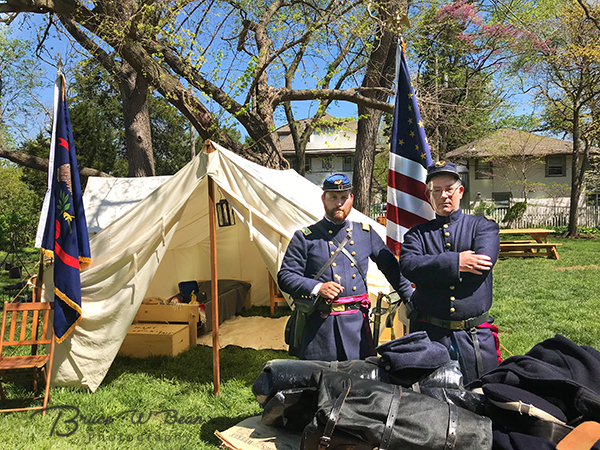 The driving tour begins at Westport Road and Pennsylvania Avenue in the Westport Area, following the battle flow, moving southward through Kansas City, Missouri and covering 32 miles before ending at 96th Terrace and Warnall Road in Southern Kansas City. 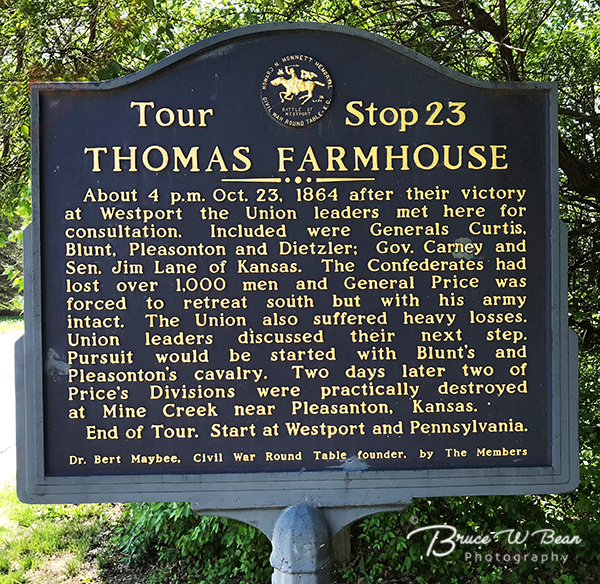 The tour includes 25 historical markers at 23 stops. 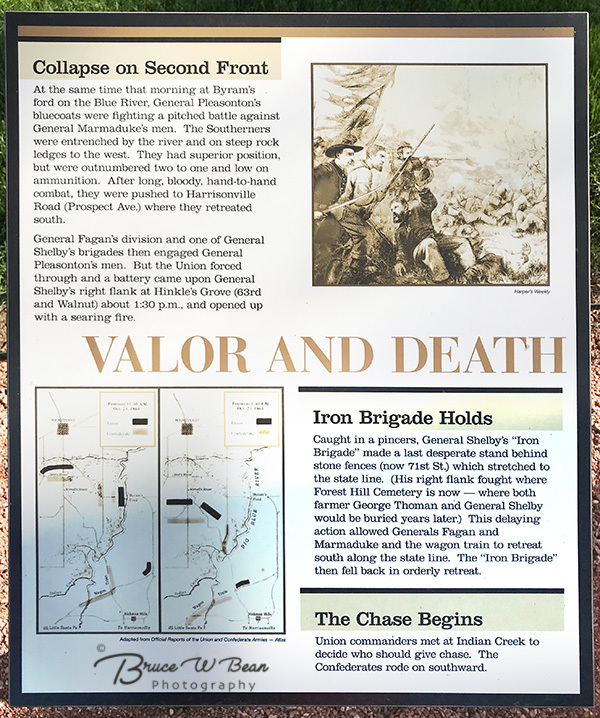 Each historical marker describes the battle actions associated with the site. 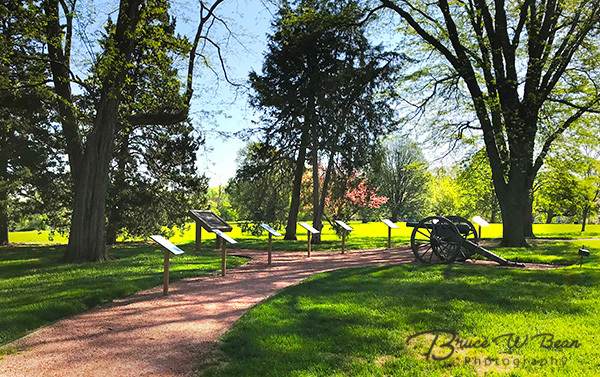 Traveling the tour route gives a sense of the space and distance covered by the battle and the markers give an historical perspective. There are few locations which will give a visual sense of the area as it might have looked at the time of the battle. Today, most markers are located in people’s front yards, at street intersections, in church parking lots, etc. Some of the stops and locations are more visually interesting than others. Each Tour Stop is indicated by a Marker of the type seen below. They give historical information about actions which occurred at the location. Some of the more interesting sites are shown below. Below is today’s view looking southward across Loose Park where Confederate and Union forces faced off in 1864. Several markers indicate specific battle positions and actions which took place in and around Loose Park. 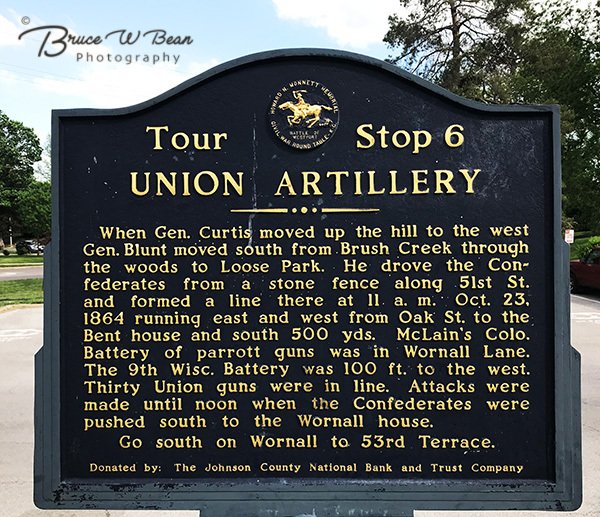 Stop 8, located on the southern end of Loose Park, offers lots of information about the battle including a map of actions in the park area, a canon, and eight markers giving a history of events ( shown at top of this article.) The Wornall House is one of the few buildings remaining from 1864. It was used as a field hospital during the Battle of Westport. In the morning of the battle Confederate wounded were treated here. As Union forces drove Confederate troops southward the Confederate wounded were removed. 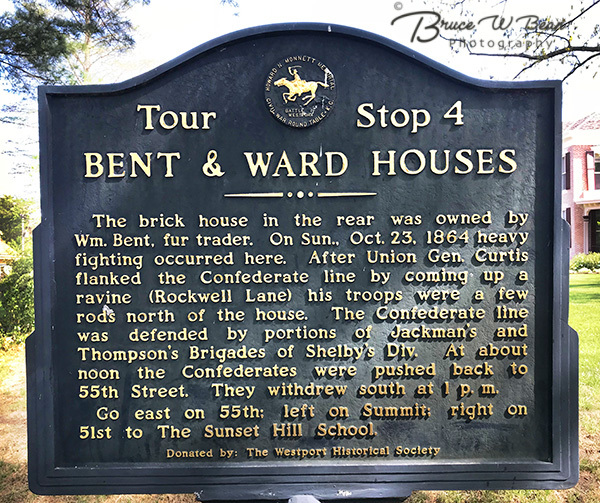 By the afternoon of the battle Union Troops moved into the area, using the Wornall House as their field hospital. 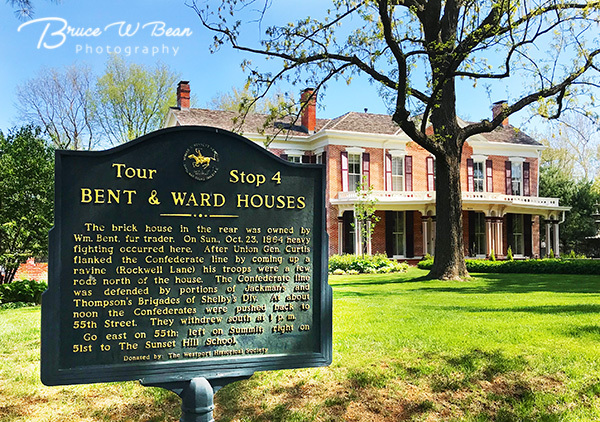 Today, the Wornall House is preserved as a museum, decorated and furnished in keeping with the Civil War era. 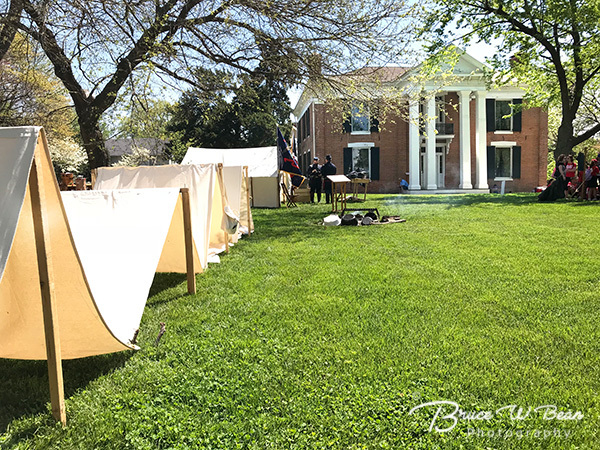 I was fortunate to visit on a day when several “Civil War Re-enactors” were set up on the front lawn of the Wornall House, giving visitors some interesting insights into the Battle of Westport. 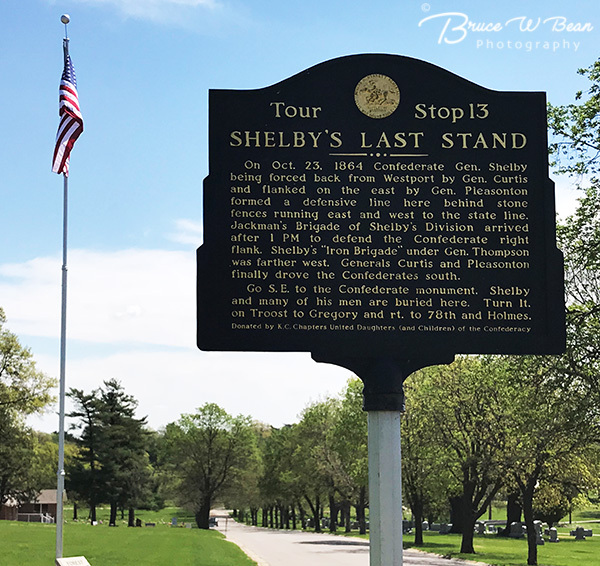 Stop 13 – “Shelby’s Last Stand” marks the line of engagement between North and South Forces late in the day of October 23, 1864. This stop is located in today’s Forest Hills Cemetery. 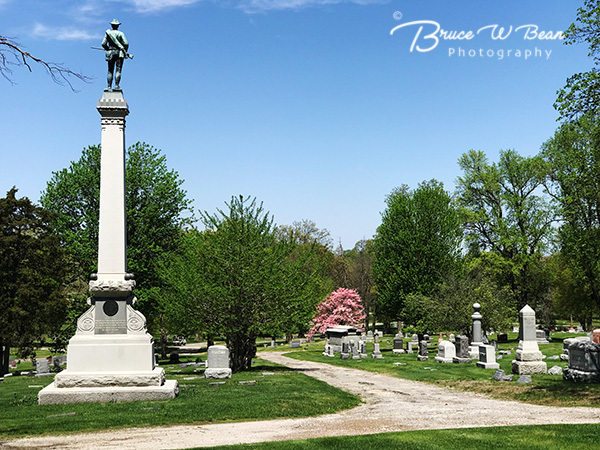 Today a large Confederate Soldier Memorial stands in Forest Hills Cemetary. 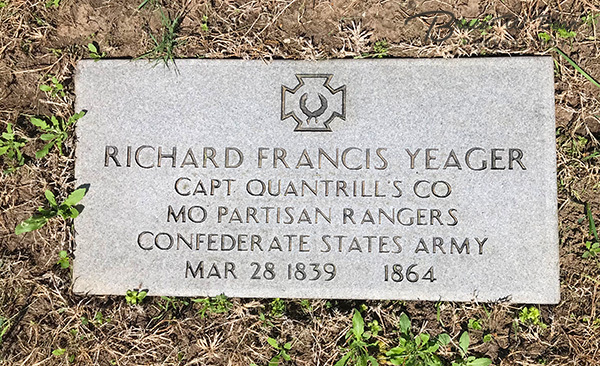 The cemetery also includes the grave sites of various soldiers from the Civil War Era including the one below of a soldier in Quantrills Company of Confederate Rangers. 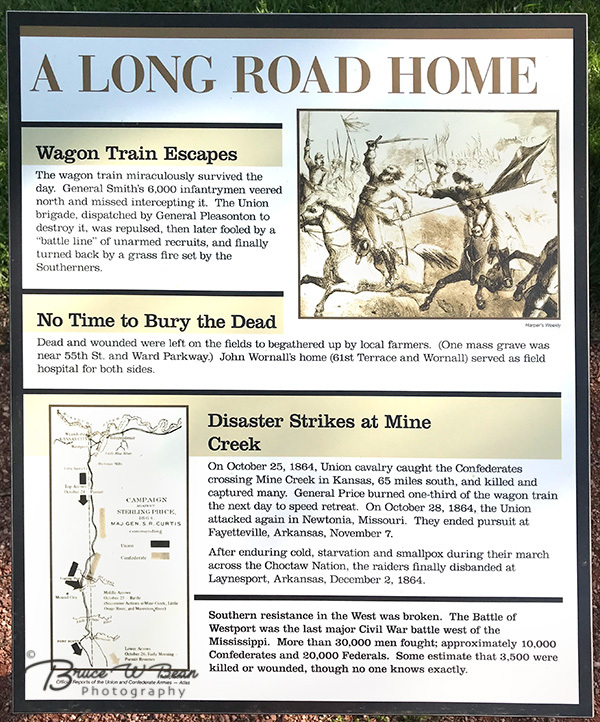 Quantrill is perhaps best known for Quantrill’s Raid on Lawrence – “The Lawrence Massacre.” In 1863 Quantrill led his 450 raiders across the Missouri border into neighboring Lawrence Kansas, sacking and setting the town ablaze and leaving about 175 “Free Staters” of Lawrence dead. 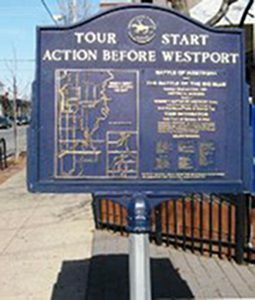 The Auto Tour lists The Battle Of Westport Visitor Center and Museum as a separate but unnumbered stop, between stop 15 and 16. 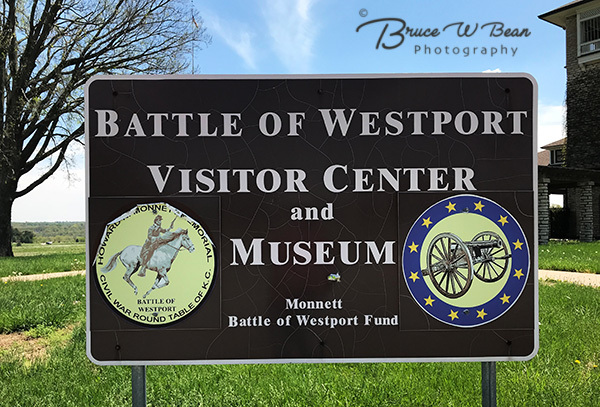 Located at the Western Entrance to Swope Park, it’s a small museum but well worth a visit, In fact, in many ways it would be a good place to start your exploration of the Battle of Westport. 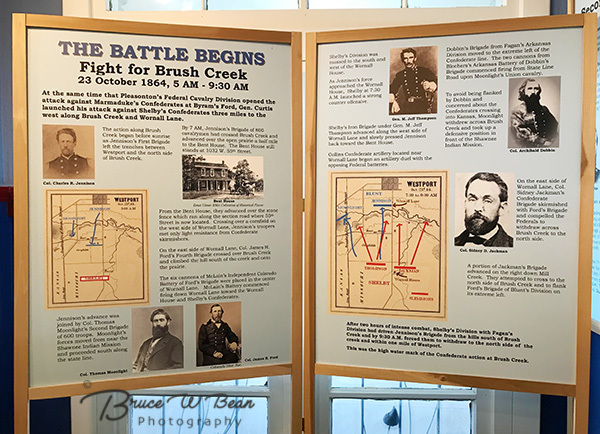 The various displays provide good background and details about the area in the 1860s as well as details of the troops and officers involved in the battle. The museum staff is also very helpful with questions. With an initial visit to the Museum you will be better prepared to understand what you see as you follow the Auto Tour stops. Be aware however – the Center has very limited hours. Open April through October, only on Thursdays, Fridays, and Saturdays from 1:00 pm to 5:00 pm. Admission is free but donations are appreciated. 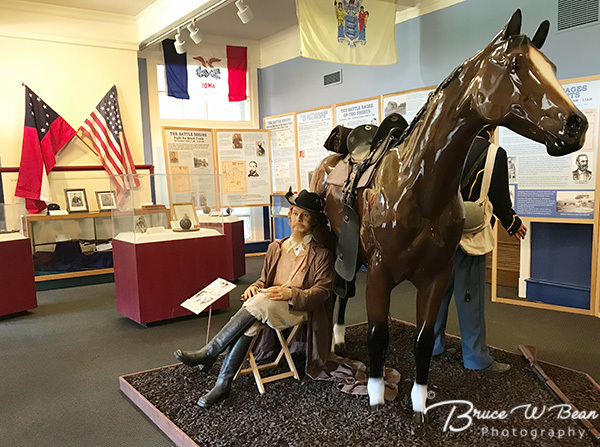 The museum offers a variety of displays showing gear used by troops as well as artifacts. Museum information provides good detailed explanations of the battle and troop movements. Stop 23 is the final Auto Tour Stop. There’s really nothing to see there other than the marker which sits at the corner of 96th Terrace and Wornall Road in Southern Kansas City. I had to hunt for it as it was partially hidden by overgrown trees and shrubbery. I made a valiant attempt to follow the entire route and to find all the markers. It took nearly 6 hours including drive time, time for photos and visits, etc. Even so I’m afraid that there were several markers I never located. Having made the journey, my sense is that ferreting out each of the 25 markers along the 23 stop, 32 mile tour is best left to those truly interested in all the minute historical details of the battle. It might also be an interesting test for those who would like the challenge of actually locating each of the markers. However, for the more casual visitor or tourist I would suggest exploring a smaller number of selected battle positions – those which offer a bit more interesting content or views. And have Fun! 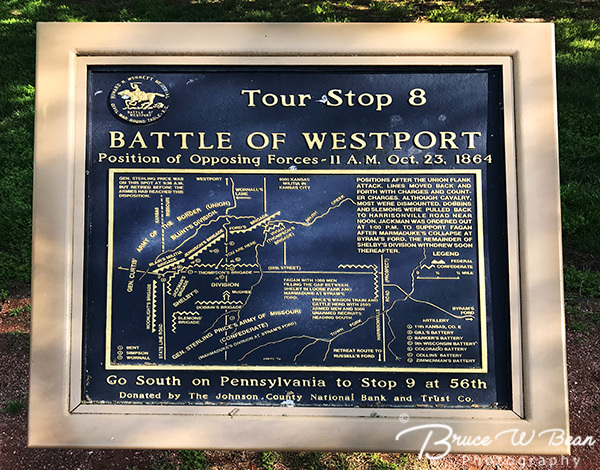 Explore The Battle of Westport ………. And Enjoy The Adventure! 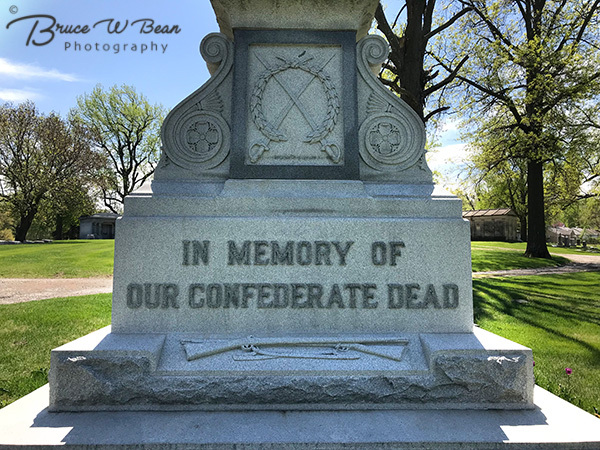 This entry was posted in Day Trips, General Photography and Travel, Travel and tagged Battle of Westport, Civil War, Kansas City, Westport by Bruce W Bean, Ph.D. Bookmark the permalink.